Theresa Regli is a strategic consultant focusing on digital asset management, data design and digital stewardship. In addition to her own consultancy, she is principal consultant with KlarisIP and partner with Jericho Chambers. She can be reached at theresa@theresaregli.com. 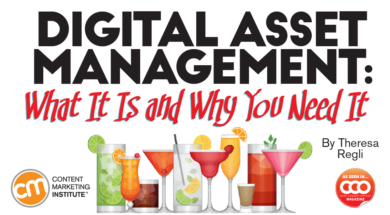 Editor’s note: The following is adapted from the author’s book, Digital & Marketing Asset Management: The Real Story of DAM Technology & Practice, published by Rosenfeld Media and copyright by Real Story Group. Since the turn of the millennium, digital media of all kinds have become an increasingly significant part of our everyday experience. Every day, we consume and interact with photos, audio files, video clips, animations, games, interactive ads, streaming movies, and even experiential marketing, which has gained a digital edge with the rise of virtual reality and augmented reality.